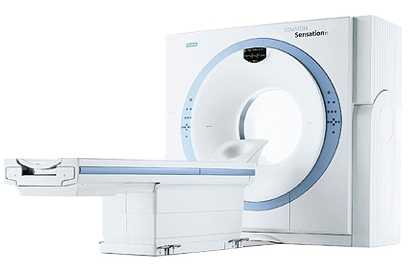 The Siemens SOMATOM Sensation 4 mobile CT scanner is similar to the 16-slice model in terms of included features and design, but this 4-slice system is known as an entry-level multislice CT scanner. The Sensation 4 CT is designed to keep pace with today’s clinics, hospitals, and private imaging centers. It offers rotation times as fast as 500ms and it is capable of completing 160 slices in a 20-second breath hold. During the scan, the Sensation 4 CT reconstructs the images at a rate of 1.5 slices a second. Therefore, even as an entry-level CT scanner, this system’s speed aims to improve image quality (due to reduced motion distortion caused by moving organs, such as the hearts and lungs) and increase your patient flow. The Siemens SOMATOM Sensation 4 CT can dramatically reduce your patients’ exposure due to its Ultra Fast Ceramic (UFC™) Detectors, optimized application protocols, and real-time tube current modulation (CARE Dose*). Lastly, this CT scanner’s easy and intuitive operation and fully integrated workstream programming allow instant data access on a shared database, enhancing your advanced data evaluation and quantification processes. The refurbished Sensation 4-slice CT scanners is an excellent, economical option for those looking to do routine scans. The Sensation 4 can produce High Resolution images at .5 and .75mm while reconstructing at up to 1.5 slices per second. This is a popular choice for a low-price CT scanner.